Key Difference: A Moron is a person who is notably stupid and frustrating or lacking in good judgment. 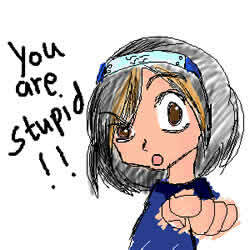 A stupid person is one who is lacking in cleverness, understanding or reasoning. Moron and Stupid are basically one and the same thing. They can be used as synonyms and just describe things or situations where, like unfavorable things happen for avoidable reasons, or when something doesn't work out. For example: "Having that meeting was a stupid idea." A person who is notably stupid and frustrating or lacking in good judgment is a moron. 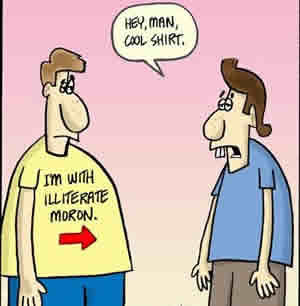 The term moron originated from the Ancient Greek word moros, meaning "dull" or "foolish". In the older times, it was observed that a moron is a stupid person with the mental age of between 7 to 12 years. However, in modern times, it just refers to a person whom one finds doing stupid things and the activities that are very irritating. Moron may also refer to places, surname, song, book, etc. A person who is lacking in cleverness, understanding or reasoning is stupid. The term stupid originated from the Latin word stupidus, from stupere, meaning “be amazed” or “stunned”. He is a person who is lacking in intelligence and common sense. It is not their fault that they are not intelligent or a bit slow; it is just that they are not able to do things in a superior manner. For example: you could have a friend who is hard-working but stupid. The term is more often used as an address. Stupid may also refer to stupid (art movement), stupid (song), stupid (film), etc. A person who is notably stupid and frustrating or lacking in good judgment is a moron. A person who is lacking in cleverness, understanding or reasoning is stupid. Places, surname, song, book, etc. Art movement, song, film, etc.